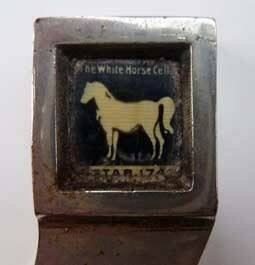 This is a very rare Whisky Advertising Item - and certainly a rare survivor from the 1930s. 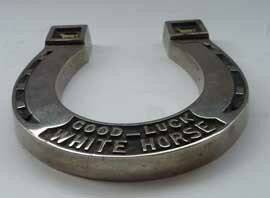 It is an advert for White Horse Whisky and takes the form of a lucky horseshoe. 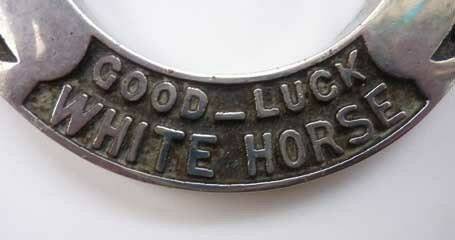 The advert is made of heavy steel - and has the words: Good Luck / White Horse. 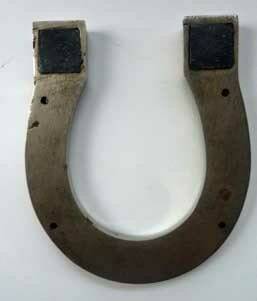 At each end of the horseshoe, there are little lozenges with the brand trademark -slightly shabby but still legible. 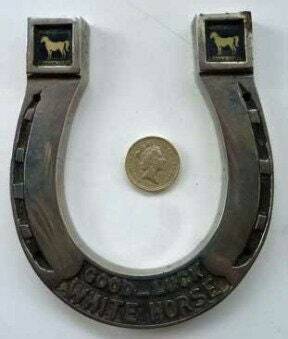 It has a good bit of weight to it and is just slightly larger than a real-life shoe would be - I have photographed it next to a British pound coin to give you an idea of scale. 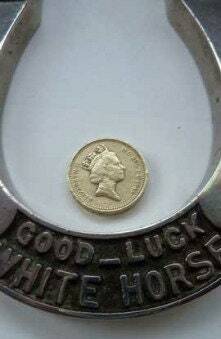 Not many of these are around now - so a special item for your collection of whisky memorabilia. Think that it might have originally been designed to stand on top of a bar with a bottle of the nectar on it - or perhaps a pub jug.